I haven’t posted a birthday party theme for a while, so I thought I would toss one out today. 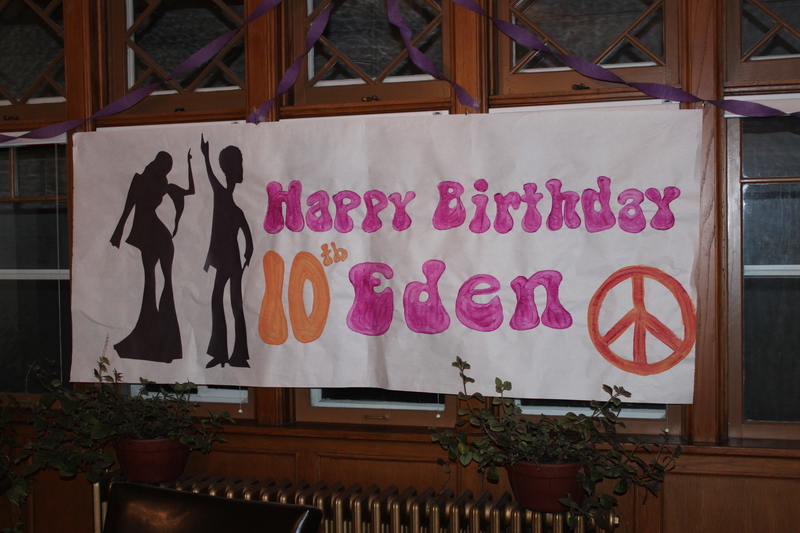 This is based on Eden’s 10th birthday. I made this invitation and envelope for the party. The invitation was made by printing the actual invitation in a white font on black cardstock. The words are on the back of the DISCO invitation. I downloaded a font called “bell bottom”. I tried to use 60 jargon (very lame, I know). I honestly don’t remember why there is green in the center, but I am pretty sure I just printed the white font directly onto black paper. I made my standard birthday banner, but didn’t do much more than that. 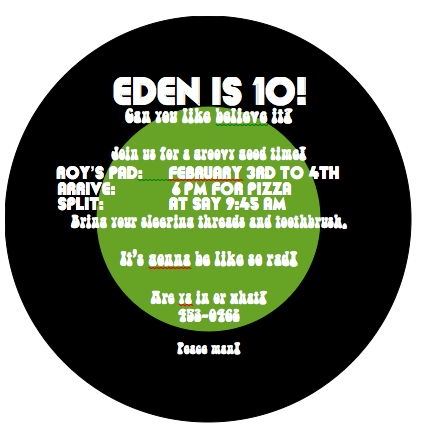 Eden is getting older and isn’t as interested in a whole party theme. I made the silhouette of the disco dancers with my overhead projector at school. I simply traced the images onto black paper and then cut them out. Again, Eden is getting older and basically wanted to hang-out with her friends. We did plan two activities and both worked out well. The girls played Just Dance on the Wii for most of the evening. For this project, I combined the ideas of from two different bloggers. Basically, I went to the thrift store and bought a few extra-large t-shirts that were white. It didn’t matter if there was a pocket or small logo on the top as they would be cut off. I washed the shirts and then off the bottom seam. I then cut across the shirt (parallel to the bottom) to create a loop scarf. I don’t remember how wide I cut them, but I think I got all of the scarves from 2 or 3 extra-large shirts (maybe 8″?) I then stretched each scarf (loop) as much as I possibly could. Each girl received one of these as her scarf. 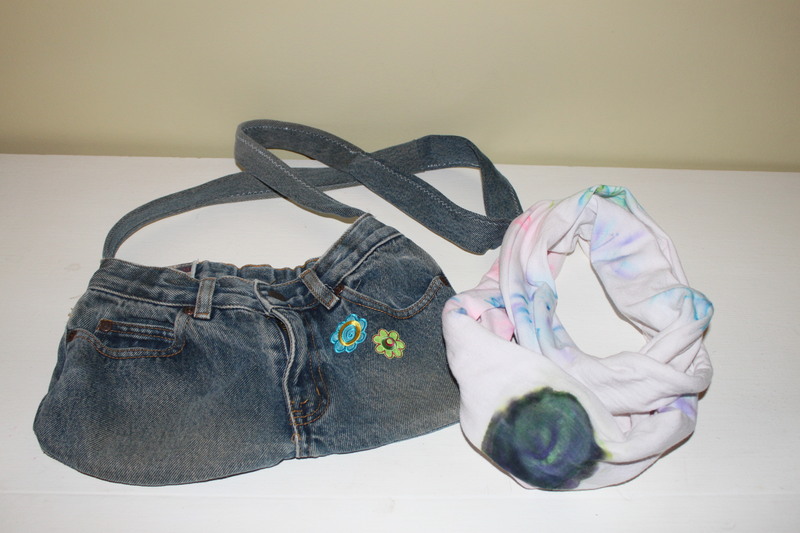 We then did Sharpie tie dye on the scarves. This worked really well and the tutorial I followed was very helpful. One caution though, just be aware of the strong fumes from using both Sharpies and rubbing alcohol. It was okay, but I wasn’t really anticipating that and it is certainly something to consider. Elastics around cup tops and colour away. Turned out great. Just need to be sure they are really stretched out to loop nicely around your neck. I actually can’t find my party plan. I usually save all of my files, but apparently I didn’t save this one. I don’t remember going theme crazy with the food for this party, but I did have fun making the cake. 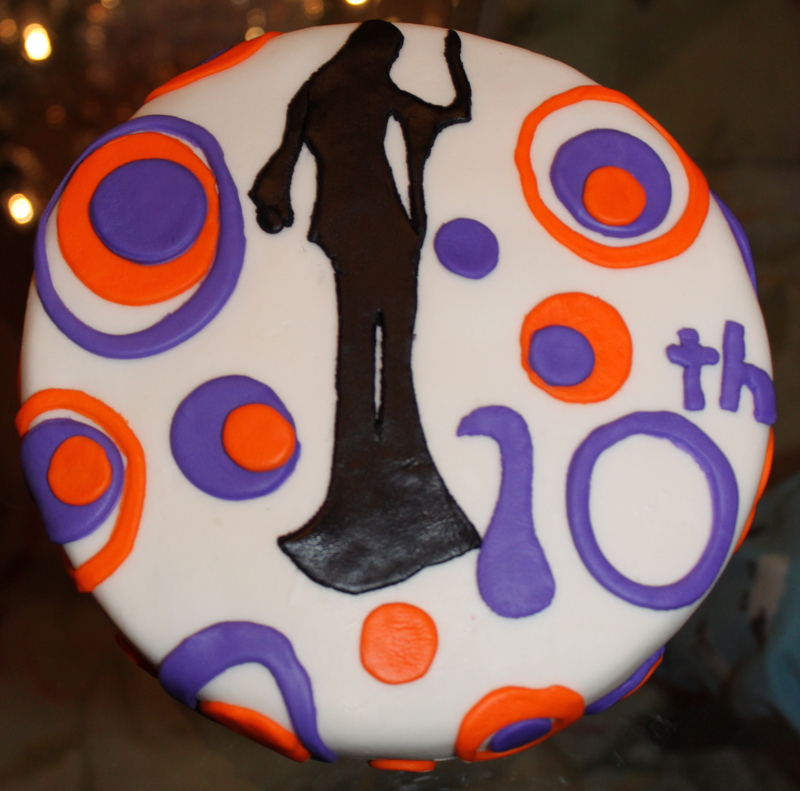 I used my regular icing to generously coat the cake and then homemade marshmallow fondant for decorating. 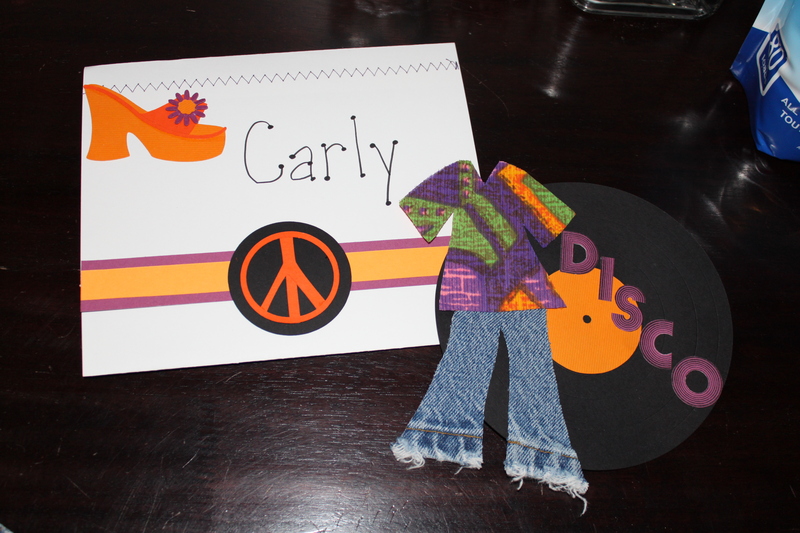 Posted on November 15, 2013 by Cindy Roy •	This entry was posted in Birthday Parties and tagged 60's party, birthday party planning, disco birthday cake, disco birthday theme, disco party invitations, disco party loot, disco theme. Bookmark the permalink.